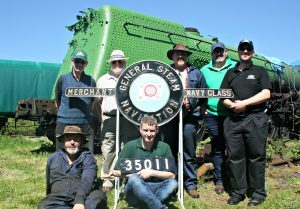 The beginning of May saw our first working party of the year on the locomotive at Sellindge. The aim of the working party was to get another coat of protective paint on the boiler, trail fit a couple of the new components and carry out some more conservation work to ensure the locomotive is kept in good condition. 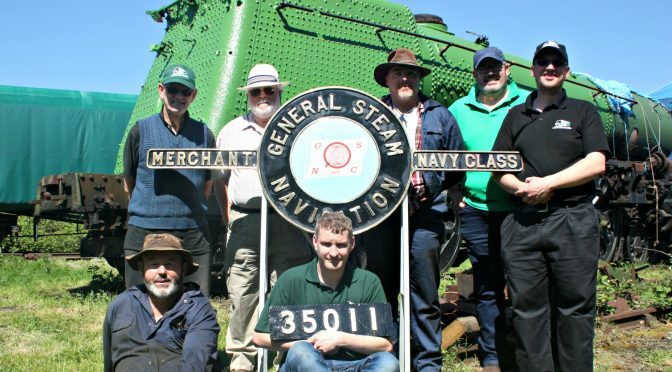 On the Monday one of the newly complete nameplates was on display with the locomotive and quite a few of our members turned up to get some photos of the two together. A lot was achieved and members will be able to find out more in the Packet which is due to land on their doorsteps in the next couple of weeks. Issue 7 of the Packet went to the printers on the 30th and it is another bumper issue. The magazine has 5 pages of engineering news, our HRA application, Cranking up the pressure, our AGM and much more. This month also saw us switch web host which has enabled the society to set up an online emailing system for GSN. 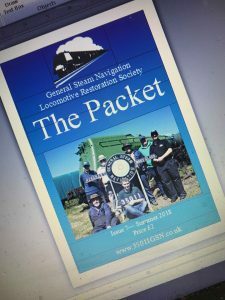 The new system will allow us to contact our members about all the exciting developments with the project as they happen rather than waiting every 4 months for the next issue of the Packet. Members can find out how to join the new emailing list in the Packet.